The presiding diety of the temple is Laxmi Varaha perumal and the utsavar is known as Nitya Kalyana perumal. This is one of the 108 divyadesams of Sri Vaishnavas in Tondai naadu. The lord is found in a very unique posture of one leg on the ground, one above Adisheshan and his spouse and Agilavalli thayaar on the left thigh. The Lord is said to have married all the 360 daughters of Sage Kaalava each day throughout the year and so the name ‘Nithya (daily) Kalyana( marriage) perumal’. The third incarnation of Mahavishnu is in the form of a boar called Varaha. There are many shrines dedicated to Varaha and one such temple is Thiruvidanthai, near Mahabalipuram. The presiding deity is Lord Lakshmi Varaha and his divine consort is Komalavalli Thayar. The temple is rich in puranic lore. Sage Kalava, believed to have 360 daughters, lived at this place which was an agraharam those days (place where Brahmins live). To get his daughters married was a Herculean task and this he surrendered to the Lord Mahavishnu, known for his benevolence, assumed the form of a Brahmachari (bachelor) and visited. Kalava’s first daughter’s house and proposed to her and tied the nuptial knot. As it was customary, after the marriage, the couple went to Varahaswamy temple to seek his blessings. The couple vanished mysteriously once they entered the sanctum sanctorum. This was repeated to the rest of Kalava’s daughters day after day. Bewildered, the sage wanted to know the fate of his daughters and sons-in-law. He prayed to the Almighty and entered the sanctum sanctorum. Lo and Behold! The Lord appeared before him as Varahaswamy. All the daughters of the sage were seated on the lapof the Lord. Symbolically, the souls of the daughters had merged with the soul of Lakshmi as one. Thus, Lakshmi signifies all his daughters in one form and sits effulgently on Varaha’s left thigh as His consort. He considered himself blessed to be the father of Lakshmi. The presiding deity, Lakshmi Varaha, holds a conch in one hand and disc in the other hand. The utsava moorthi (procession deity) is ‘Nithya Kalyana Swami’. It is surprising to note that there is a small scar on the face of ‘Nithya Kalyana Perumal’. Since the marriages happened every day for 360 days, the Lord is fondly called by that name: nithya means daily, and kalyanam means marriage. The deity is decorated with 108 saligramam (celestial stone) around the neck. 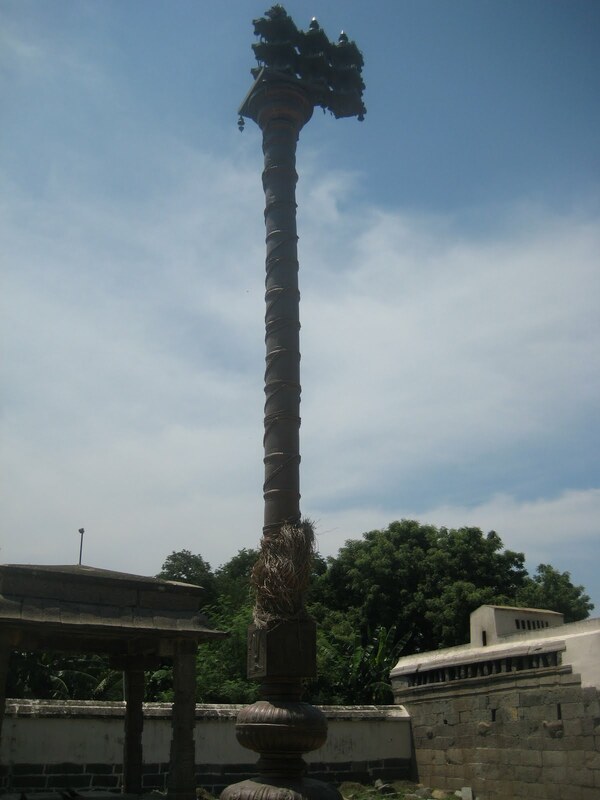 Legend has it that Hariseka Maharaj possessed the garland originally, and being a staunch devotee of the Lord, he presented it to Varahaswamy. It is beleived that unmarried men and women will get married if they visit the temple and offer worship to Varahaswamy. The Lord here is said to have appeared before Markandeyar. 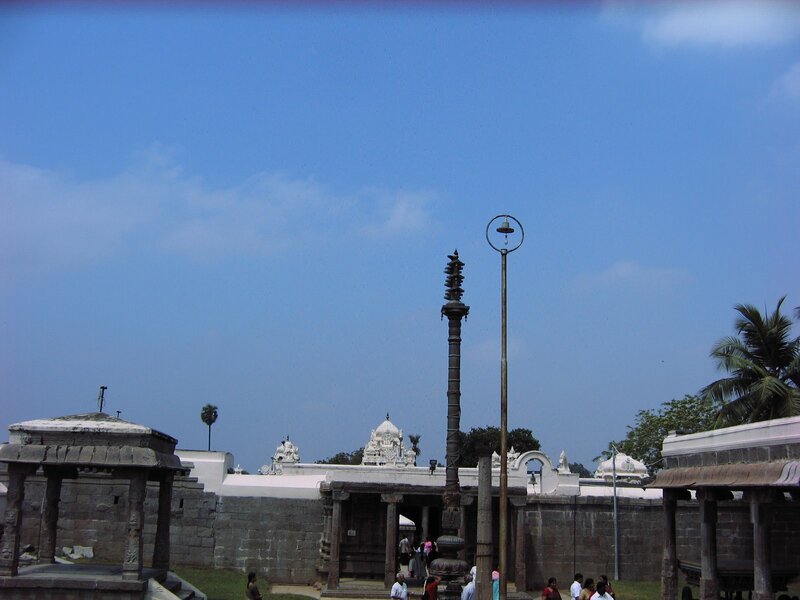 There are separate shrines for Andal, Lord Ranganatha, Ranganayaki. The holy waters are Kalyana Theertham and Varaha Theertham. Many Azhwars have extolled the greatness of this Lord. It is one of the 108 Divya Desams of Vaishnava sampradaya. It is situated en route to Mahabalipuram on the East Coast Road, near Chennai. Thiru Ida Yenthai, a small but scenic village, is about 40 km from Chennai en route Mamallapuram. This holy pilgrim centre is one of the 108 principal Vaishnavite kshetrams. Here is the Lord with the wild-boar (Varaha) face hailed as the Sri Lakshmi Adi Varahaswamy, who has his right foot, raised knee-high, resting on the many-hooded serpent Adi Sesha, his couch, throne, umbrella, and foot rest. This sacred shrine faces the sea on the east, and has, for its environs, tall trees and lush groves aplenty, giving the pilgrim sublime peace and equipoise. The centre earns its name due to the fact that the 9-foot-high Lord’s idol has his consort Bhoomi Devi (Mother Earth) seated on his left thigh (‘Thiru’ : Sacred : Consort : Ida Venthai : left side). 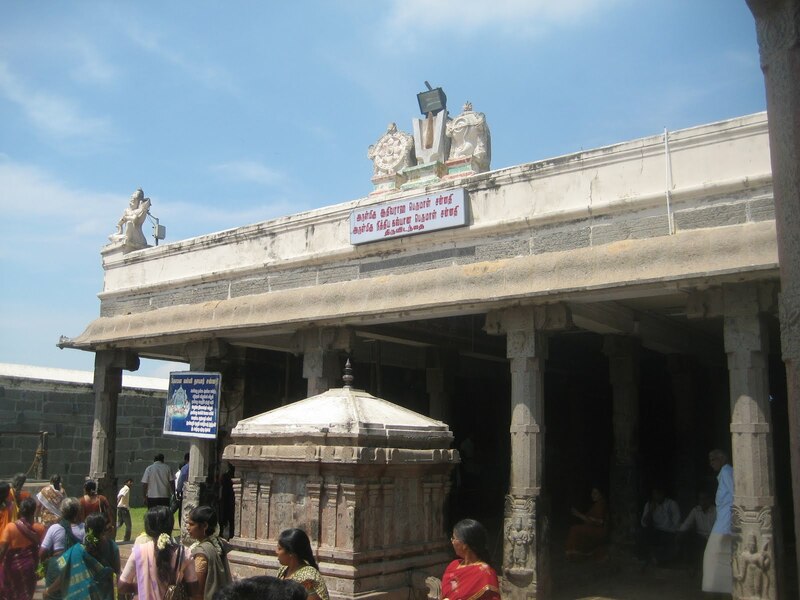 It is pertinent to point out here that at the Mamallapuram temple, Lord Varahaswamy has his consort on his right side and, hence, the shrine is known as Thiru Vala Venthai (Vala : right side). Thiruvidaventhai soon got changed to Thiruvidanthai by which name it is presently known. The moolavar (immovable principal idol) is worshipped as Sri Akhilavalli Sametha Adi Varahapperumal or Jnaanappiran, the embodiment of all wisdom and knowledge. Thirumangai Alwar, the hierarchically juniormost Alwar, is the only Alwar to have sung on this Lord ten pasurams (Peria Thirumozhi - 2.7.1 to 10) glorifying his form and attributes. It is the firm belief of all devotees that a devout prayerful pilgrimage to this sacred shrine will ensure speedy marriage and lifelong prosperity. The utsavamurthy (the processional idol) Sri Nithya Kalyana Perumal has for his consort Sri Komalavalli Naachiyaar (Komalavalli - the Goddess typifies a delicate creeper : tendril). Legend has it that sage Kalva obliged a celestial maiden by name Kuni to attain eternal salvation by enabling her to beget children. As destiny would have it, the blessed couple parented 360 children, females all! The celestial maiden left for her heavenly abode. The sage, burdened with 360 fast-growing female children, was counselled to worship Lord Varahaswami at Thiruvidaventhai and get suitable bridegrooms for them all in due course. It is said the Lord himself came down before the sage in the form of a young and charming bachelor and, in pursuance of the sage Kalva’s earnest prayers, agreed to marry all his 360 beautiful daughters. So, in the next 360 days, the celestial bachelor, Lord of Lords, married all these maidens, one by one for one whole year. Hence, he earned the appellation ‘Nithya (daily) Kalyana (marriage) Perumal (the Lord of Lords)’, meaning ‘the Lord who gets married every day’. But, lo! All the 360 brides got transformed into one single bride. As the first maiden’s name was Komalavalli, the combined form of all these maidens into one came to be worshipped as Akhilavalli Naachiar (Akhilam signifying ‘many’ : Akhilam also means the ‘world’ and, therefore, Mother Earth, Bhoomi Devi). Thiruvidaventhai or Thiruvidanthai is also hailed as Nithya Kalyana Puri or Sri Puri (‘Sri’ signifying the ‘Divine Mother’). As the Lord appears in the form of ‘Varaha’ (the giant tusker boar, who redeemed Mother Earth from the clutches of demon Hiranyaksha, who rolled her into a ball and hid her in the ocean), the pilgrim centre is also revered as Sri Varahapuri. The Nithya Kalyana Perumal utsavamurthy is invariably dressed and decked as a bridegroom and marriages are celebrated everyday. Even the ‘drishtippottu’ - the dot placed on the left cheek of every bridegroom, to ward off evil spirits - is placed on the Perumal’s cheek on all days as he is the daily bridegroom, the ever bridegroom! Epigraphical evidences found in the temple precincts advise us of the relative antiquity of this Thiruvidanthai Sri Akhilavalli Sametha AdiVarahaSwami - Nithya Kalyana Perumal Temple, from the 10th to 16th centuries A.D. Chola, Udaiyar, Rashtrakuta and Pandyan kings have worshipped the Lord at this temple and have bequeathed meaningful gifts as was the custom prevalent then. There is a separate shrine for Komalavalli Thayar. Holy dips in the Varaha Theertham's sacred temple tank in the month of Masi (Feb-March), in the Kalyana Theertham in Chithirai (April-May) and in the Ranganathar Theertham in Margazhi (Dec–Jan) would ensure wish-fulfilment and ultimate redemption. A nine-time circumambulation of the temple precints in the enjoined manner assures pleasing and speedy wedlock. Sage Kuni and his daughter performed penance on Lord Narayana to reach Sorga-Paradise. Kuni alone reached Sorga but not the daughter. Maharshi Narada told the young girl that she could not reach Sorga as she was not married. He requested other sages to marry her. One Kalava Maharshi married her and got 360 female children. He performed penance on Lord Narayana begging Him to marry his daughters. Narayana did not come. A brahmachari – bachelor came one day there saying that he was on a Divyadesa Yatra. As he was very handsome as Nayarana, the sage requested him to marry his daughters. He agreed and married one each day. On the last day, He showed what He was. He was but Narayana in the form of Varaha. He fused all the daughters into one and had them on His left lap. As Perumal had them together in one form on His Left Lap (left in Tamil is Idam) the place came to be known as Tiruvidavendhai which later changed as Tiruvidandhai. Lord of the temple is praised in the Mangalasasanam hymns of Saints Tirumangai Azhwar and Manavala Mamunigal. There is a dot on the cheek of the Lord which is considered as a protection from the jealous look of others. Mother made a single woman fusing together 360 virgins, hence praised as Akhilavalli Nachiar. The philosophy behind this is described as that Lord Vishnu alone is Purusha the male and all others are but females. He is Nayaka. Others are Nayakis. Mother in Her separate shrine is worshipped as Komalavalli. 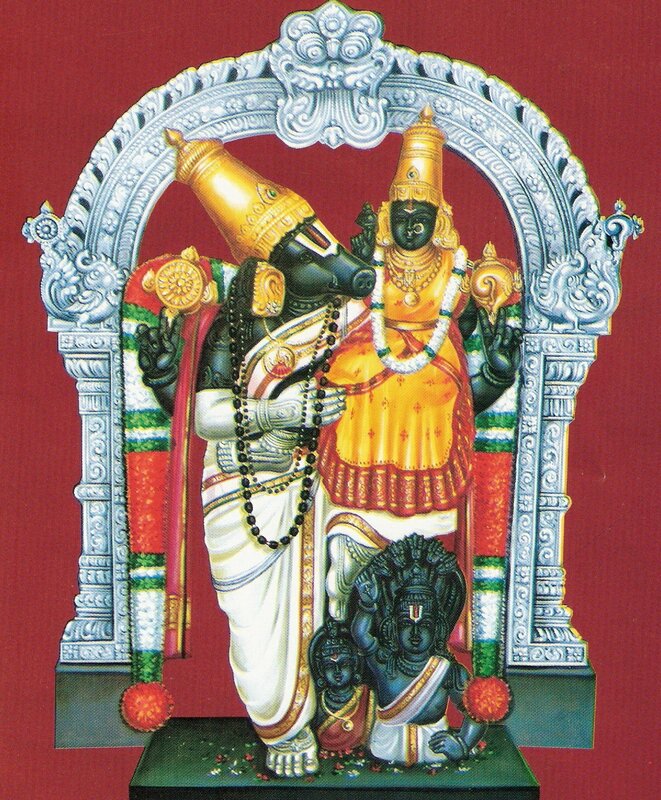 Lord Perumal in the temple appears with one foot on earth, the other on the heads of Adisesha and his wife and having Akhilavalli Thayar on His left lap and graces as Lord Varaha Murthy. 06:00 am to 12:00 noon ; 03:00 pm to 08:00 pm. 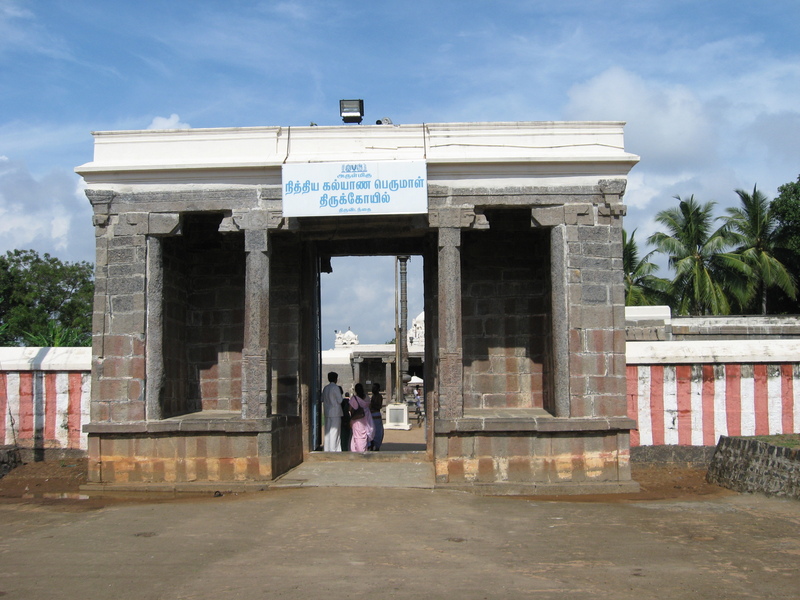 The temple is easily accessible from Chennai and is near Kovalam. It is about 40 kms from Chennai on the East Coast Road that connects Chennai to Mahabalipuram. Lots of buses ply from various parts of the city to Mahabalipuram/Mamallapuram. Another option would be to catch a bus to kovalam and then travel from there by an auto. The temple is at a walkable distance from the bus stop on ECR road.